Happy June! Whether you’re relaxing on vacation or putting in hours at an internship, catch up on some fun news stories from May. Every May, thousands gather at Cooper’s Hill outside a small British town to watch the cheese rollers. About 40 contestants throw themselves down a hill after a nine pound wheel of cheese, which can reach speeds of 70 miles per hour. The first one to catch the cheese, wins. This year, Chris Anderson broke the world record for most cheese wheels won — 22 in his 14 years competing. As amusing as this might sound, it’s no easy feat. Anderson suffered a broken ankle, a concussion and bruised kidneys during his 14 years competing. Regardless, I can’t help but watch the videos and chuckle. Kylan Scheele was banned walking at his graduation ceremony after listing his Missouri high school for sale on Craigslist. For just $12,725, bidders would receive the high school and all the amenities the ad offered, such as a huge parking lot, “great for partygoers.” Scheele has since apologized for the joke. The American Civil Liberties Union has filed a lawsuit against the school district, contending the harsh punishment is restrictive of Scheele’s freedom of speech. Forget talking politics — May brought the most controversial debate in recent memory: Do you hear Laurel or Yanny? Celebrities and even White House officials weighed in. Turns out, it can be both based on how your brain interprets frequencies. Since the recording is low-quality, there was a lot of ambiguity. If you’re hearing Laurel, you’re picking up on lower frequencies, and if you’re hearing Yanny, you’re listening for the higher frequencies. If you change the pitch, you can likely hear both words. Science rules! This expert, however, believes the original recording is most likely “Laurel,” so if that’s what you hear, you win bragging rights (but I will stick with Yanny until the day I die). President Donald Trump isn’t exactly known for his highly elevated syntax or eloquence. In the past, he’s baffled the nation with cryptic nonsense tweets like “covfefe” or been criticized for blunders such as misspelling his own wife’s name. He got schooled — quite literally — by a retired schoolteacher who marked up a letter he wrote her. “OMG this is wrong!” she wrote, adorning the page with pens and highlighters the way she would to a student’s paper. Let this be a lesson (though, as a journalist I may be biased in this statement): nothing is more important than grammar. Originally published by The Post on June 1, 2018. I read about the cheese rolling contest, probably on the internet. Anyways, I’ll leave the “fun(?) 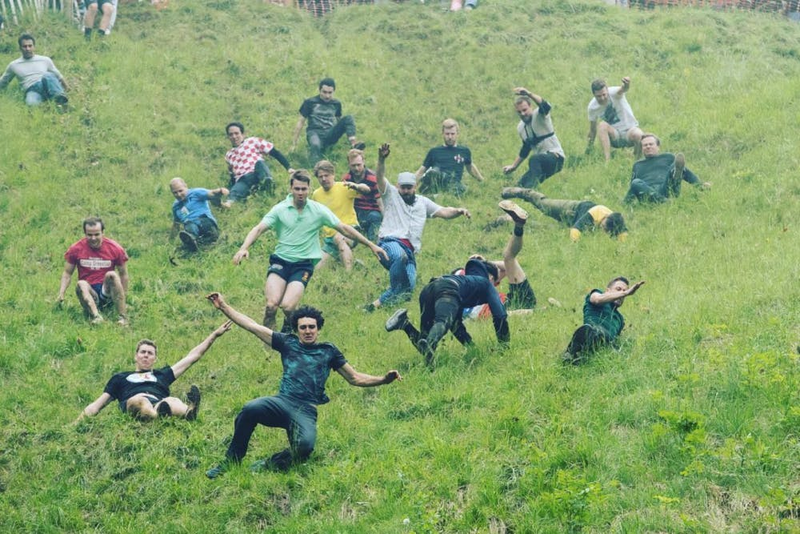 of cheese rolling to those guys- thank you. I agree with you about the grammar. I’ve forgotten a lot of what I learned in school, but, although I tend to abbreviate quite a bit, I do try to be aware of my spelling. ( spell check helps with that).